Was Sam Langford the Most Feared Fighter in Boxing History ? This writer still remembers former heavyweight champion Jack “Manassa Mauler” Dempsey, 54-6-9 with 44 knockouts saying “I only feared one Fighter!” Though rumors were he was ducking Harry “Black Panther” Wills, 70-9-3, 56 knockouts, of New Orleans, La., few believed it. Wills was 11-2-2 against Sam “Boston Bone Crusher” Langford, who Dempsey claimed he feared. Langford fought from 1902 to 1926, compiling a 178-29-39, record with 126 knockouts. He started out at 155 lbs. going up to 192 lbs. in 1920. He was only 5:07 ½ born in Canada but lived in Boston. In April of 1906 he was only 156 lbs. when he lost to then “Colored” champ Johnson who was 185 lbs. 1906. 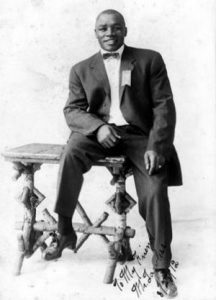 He would win the 158 lb “colored title in 1907 and eventually “claim” the heavyweight title in 1909 when Johnson refused to fight him again. Langford was shorter than most of his opponents. They also had NWS newspaper decisions with the press deciding who won. So you may see two records for boxers back then with and without newspaper decisions. Langford defeated NWS 6 one of the all-time great Middleweight champions Stanley “The Michigan Assassin” Ketchel, 48-5-4, in Ketchel’s last year of boxing in April of 1910. In October of 1910 Ketchel was shot to death avoiding a rematch. He defeated then World Lightweight champion Joe “Old Master” Gans, 134-8-17, in a non-title fight in December of 1903. He drew with Joe “Barbados Demon” Walcott, 87-15-17, in a World Welterweight bout in December of 2004. He stopped future World Light Heavyweight champion “Philadelphia” Jack O’Brien, 147-13-26, in August of 1911. He knocked out Harry Wills, 22-1-4, in November of 2014 in their first of eighteen meetings. He defeated “Young” Peter Jackson, 75-27-24, what was billed as the World Colored 158 lb Title. He knocked out Iron William Ian Hague, 17-1-1, billed the English Heavyweight Title in May of 2009 in London. He defeated Sam McVea, 54-6-4, in April of 1912, who he fought twelve times. In 1990 when the IBHOF got started Langford was among the many great’s that was inducted into the IBHOF. He was also inducted into the World Boxing Hall of Fame.